sau 19494 de puncte. Detalii. information and learn to integrate their existing knowledge to a real-life scenario from start to finish. Each chapter focuses on a common presenting symptom (e.g. chest pain). By starting with a symptom, mirroring real life settings, students learn to draw on their knowledge of different physiological systems - for example, cardiology, respiratory, gastroenterology - at the same time. All the major presenting symptoms in general medicine and surgery (mapped to UK medical school curricula) are covered, together with a broad range of pathologies. 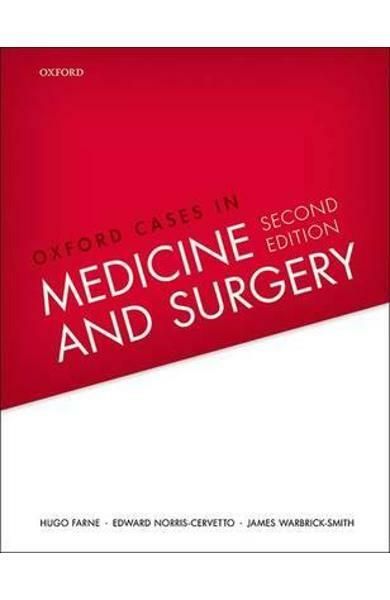 Cartea Oxford Cases in Medicine and Surgery - Hugo Farne, Edward Norris-Cervetto face parte din categoria Surgery a librariei online Libris.ro si este scrisa de Hugo Farne, Edward Norris-Cervetto, James Warbrick-Smith.